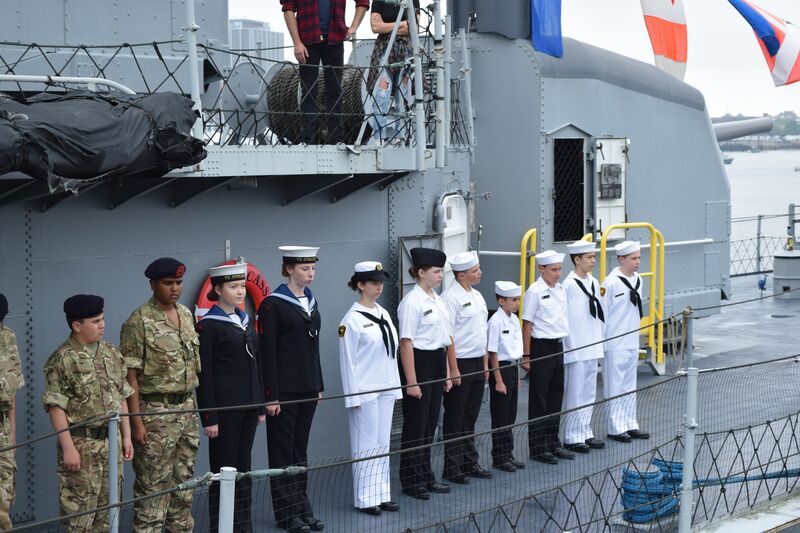 On 16th July 11 cadets and three Cadet Force Adult Volunteers from TS Stirling Sea Cadets in Birmingham set off for the adventure of a life time in the USA. 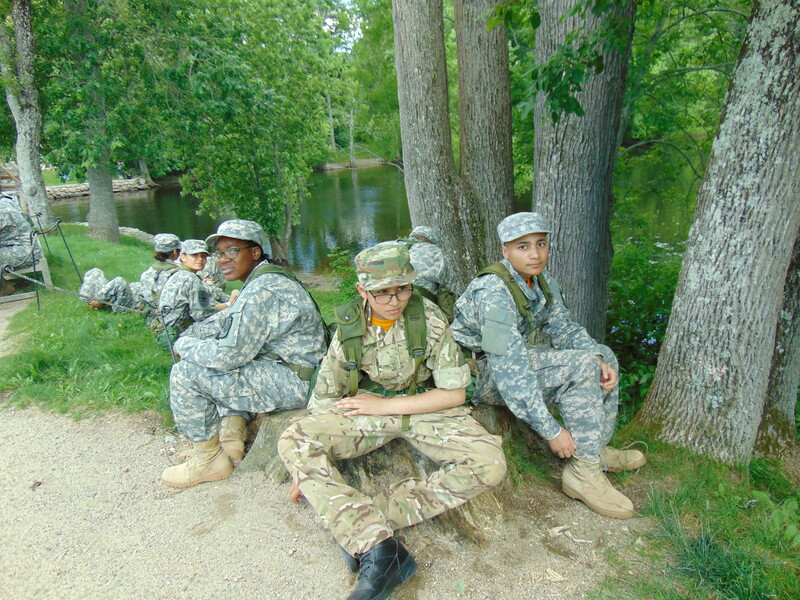 They were off to join 300 American cadets from 19 high schools in New England that are part of the Commonwealth of Massachusetts Army League (COMAL). 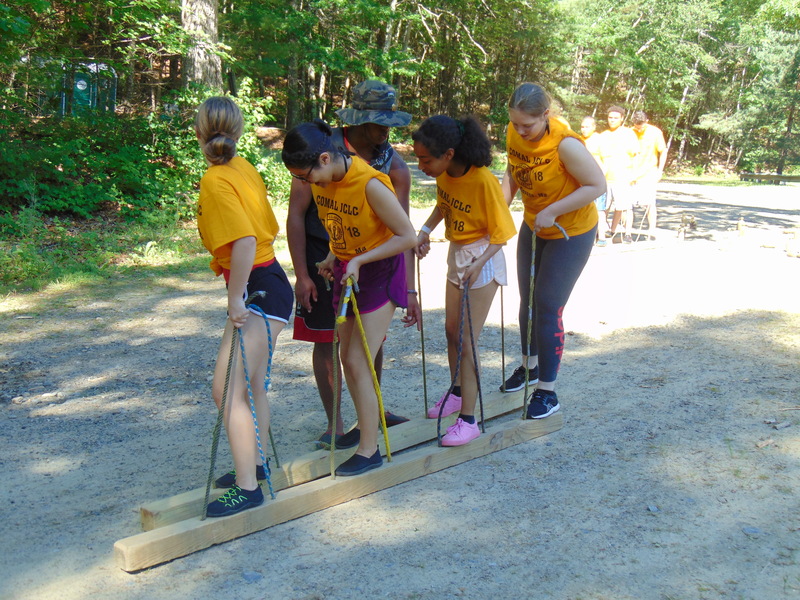 Every year they come together for a five day Junior Cadet Leadership Challenge (JCLC) at Fort Devens, near Boston. Our 11 cadets were comprised of six senior cadets from the community side of TS Stirling and five, newly enrolled cadets from Tile Cross Academy. The school has recently joined the Cadet Expansion Programme and form ‘Forward Division’ of TS Stirling with both Sea and Royal Marine cadets. Upon arrival in Boston the party settled into the Constitution Inn, a YMCA in Charlestown Navy Yard which offers a generous military discount. 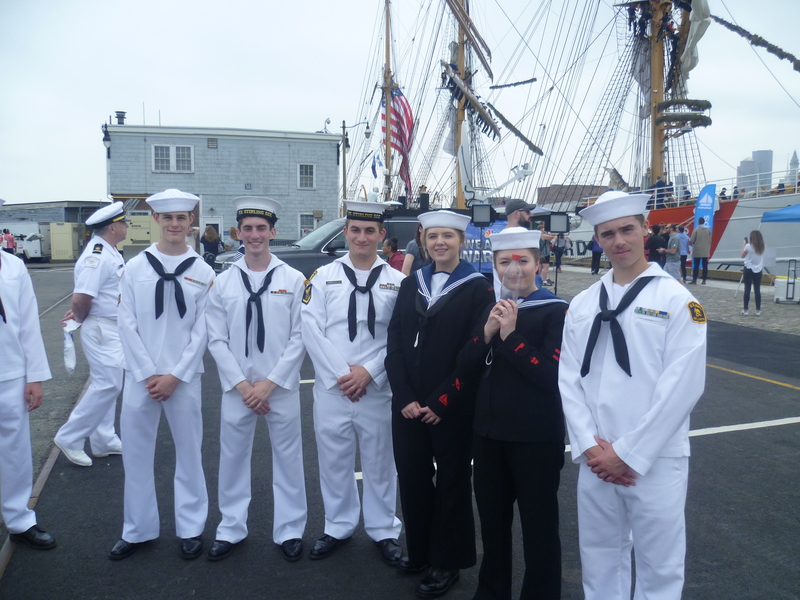 The first task for all the cadets was to prepare their uniform for the next day when they were to be part of the opening ceremony for Sail Boston – the Tall Ships visit. 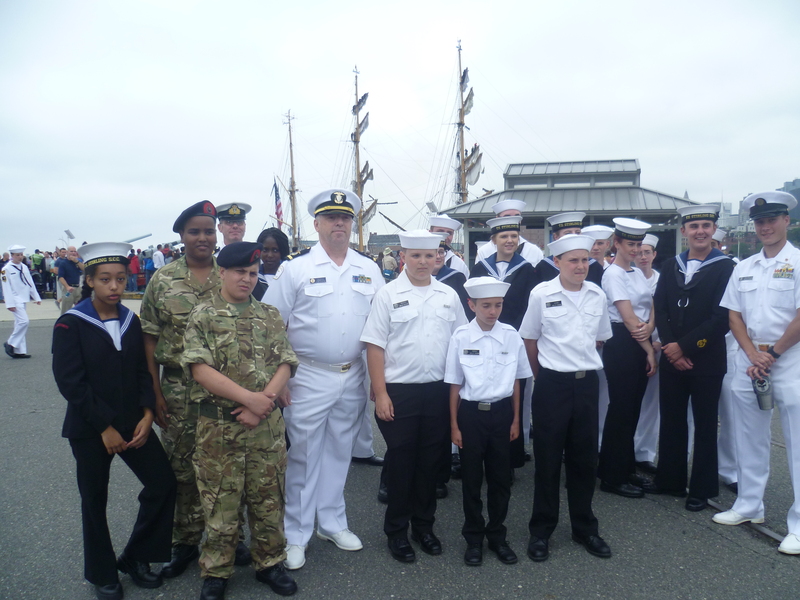 We had been invited to take part by the Massachusetts Bay Division of the US Navy Sea Cadet Corps. Saturday started overcast and damp, with the threat of rain. The cadets, however, looked very smart in their No.1s as they joined their American counterparts who were dressed in their summer ‘whites’. 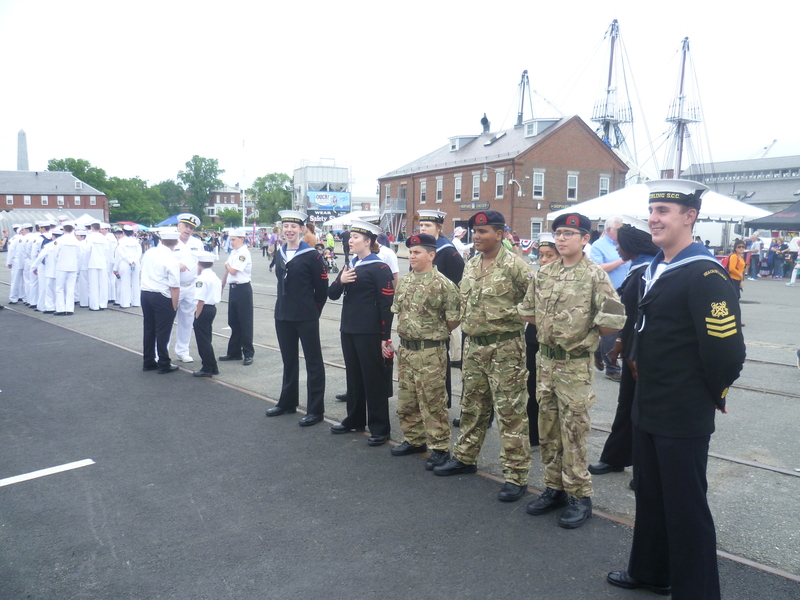 Our Cadet Chief Petty Officer, Luke Walford, quickly integrated with the US Petty Officers and combined the British party into the ceremonial parade. 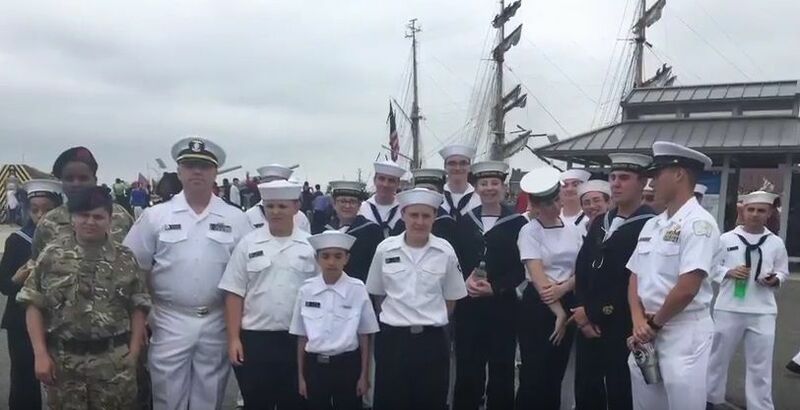 The weather meant a delay to the ‘Parade of Sail’ so the captain of the USS Constitution opened the warship for an exclusive tour by the cadets of both nations. The USS Constitution is the oldest commissioned warship afloat in the world – normally! At the moment she is in dry dock undergoing repairs. She holds a similar place in US cultural heritage as HMS Victory has in the UK. The Constitution was the first USN warship to defeat the Royal Navy in battle and is known as ‘Old Ironsides’ as a result. Although we only shared four hours with the USN Sea Cadets firm friendships, ongoing on social media, were formed with cap tallys given out freely to our new comrades. Sunday was a site seeing day that included a private viewing of the Ancient an Honorable Artillery Company’s museum during which we discovered that cadet Rheo Winter was a history enthusiast who was especially interested in the members of the Company who had won the Congressional Medal of Honor. That evening we ate pizza at the famous Santarpio’s restaurant in East Boston. It was a bit like being in an episode of The Soprano’s! Monday morning meant an early start with breakfast in Dunkin Donuts at which the cadets were all pleased to be given a 20% police discount because they were in uniform! By 0730 the party were on a coach with 30 cadets from East Boston High School heading for Fort Devens. Upon arrival all cadets were split into three companies of two platoons each. This was an anxious time for all the cadets who were split up from the school mates and friendship groups. For our cadets the transition was even harder because they had to learn a whole set of new drill and words of command. The company staff quickly set about building an esprit de corps and identity unique to their company. This was to forge new friendships and break down barriers. Being the US Army this involved lots of chants and ‘cadences’. It was so successful that almost all the UK cadets were in tears when they had to say goodbye to their new friends at the end of the week! Civilian Marksmanship (air rifle shooting) and a Staff Ride of the Revolutionary War battle sites. 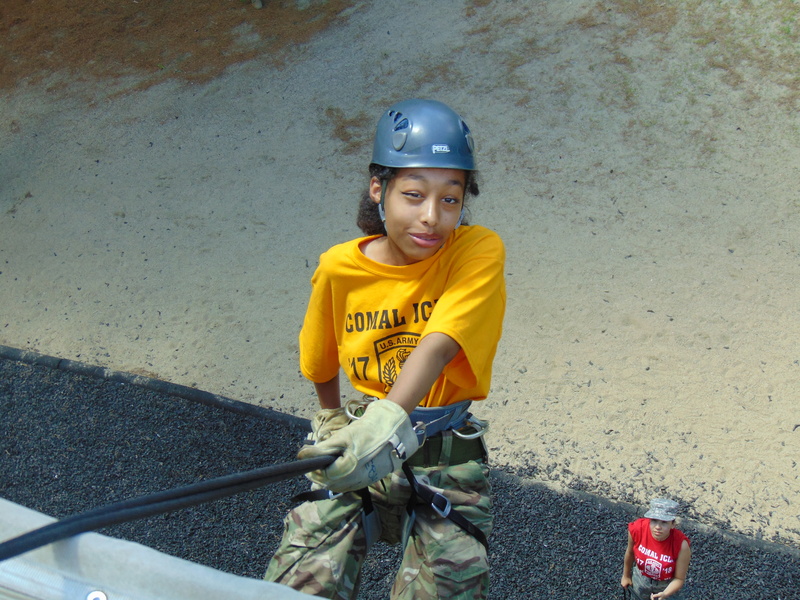 Leadership Reaction Course (command tasks/personal leadership tasks) and the rappelling tower (abseiling). Throughout the week cadets were given command appointments from company commander down. They were assessed on, and expected to self-assess, their performance using the criteria used by the university Officer Training Corps programme. Indeed it was usually university officer cadets on attachment who were conducting the assessments. The Staff Ride was particularly moving for UK participants. It followed the events of the Battle Road which started the Revolutionary War. After an audio visual presentation at the Minute Man Museum the cadets were then walked through the major engagements of the battle, ending up at the Old North Bridge in Concord. Along the way the cadets would pause at the graves of British soldiers to lay wreaths and play the Last Post. It was always the British cadets who were chosen to lay the wreaths alongside the correct Union Flag for the period. It has forged strong links between TS Stirling and the new cadets in Forward Division. 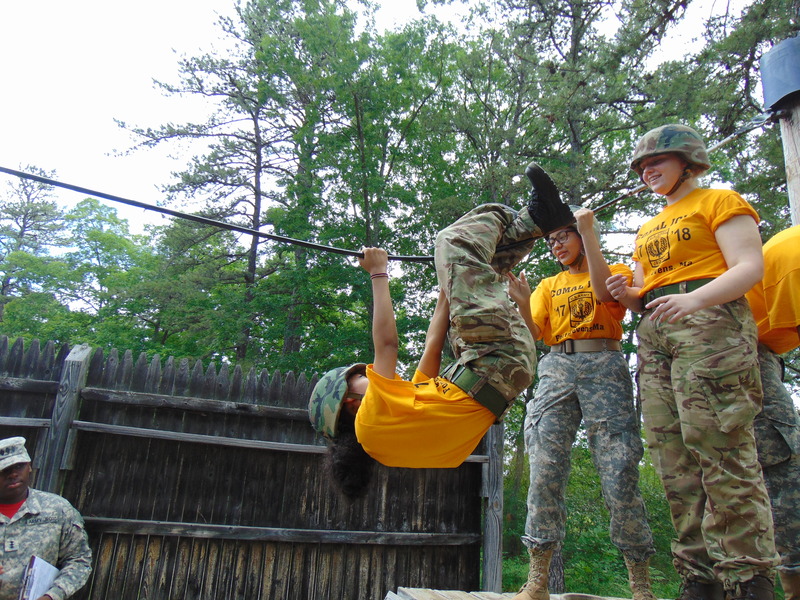 The new cadets have been fully immersed in a military environment for seven days with six senior cadets to act as role models. 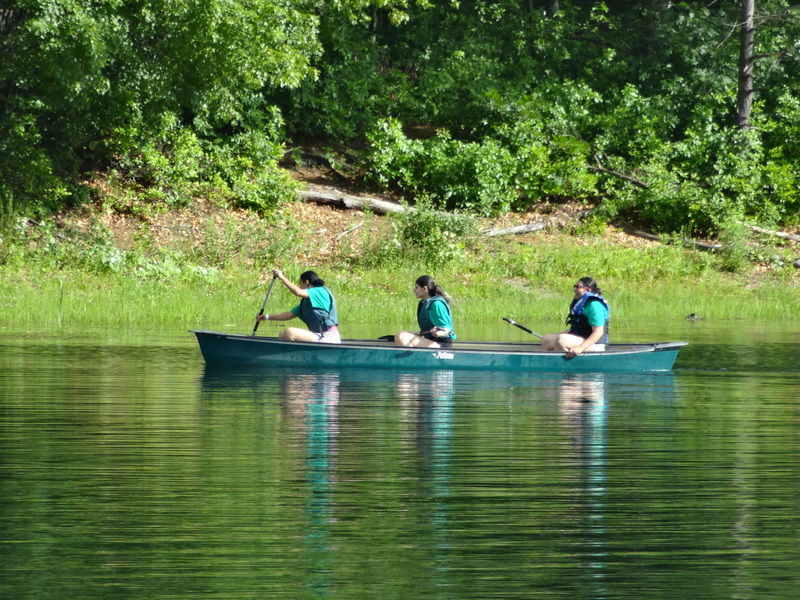 All the UK cadets gained enormously from the experience in terms of self-confidence, personal skills, and social skills. None of the cadets had been to the USA before and one had never been abroad before or flown in an aeroplane. Great transatlantic friendships have been formed. 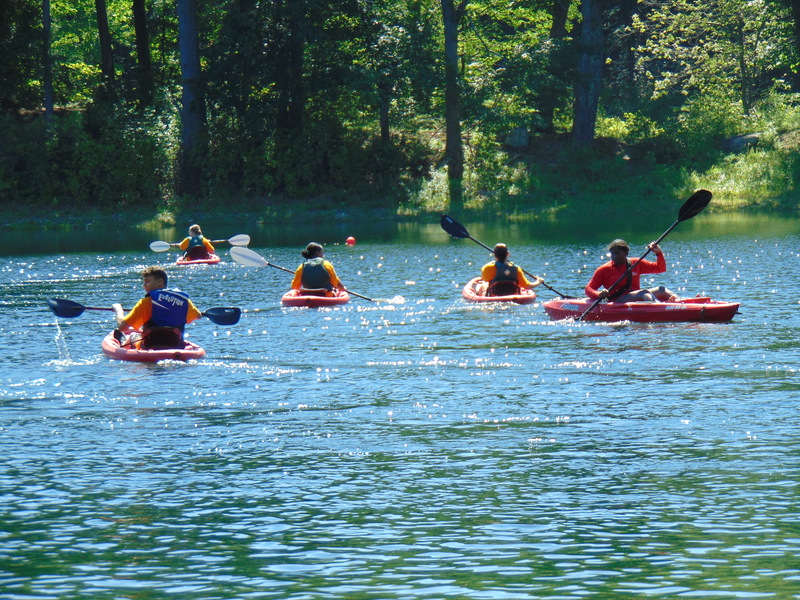 For the adult participants it was also truly enriching on numerous levels that varied from person to person. Two described it as the ‘trip of a life time’. 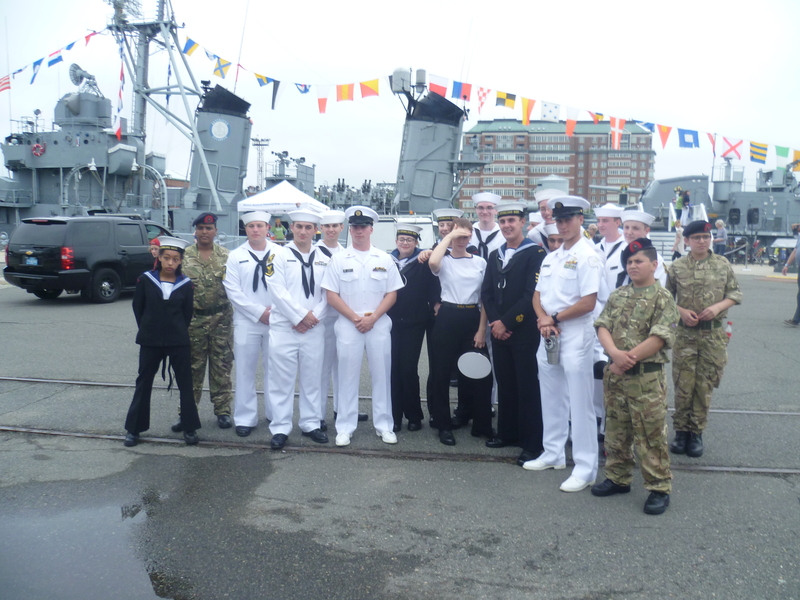 Great partnerships have been forged between the US Navy Sea Cadet Corps and the Commonwealth of Massachusetts Army League that can only benefit cadets in both countries in the future. The added value of our visit to the Americans should not be overlooked. Our participation was really appreciated and seen as making their events specials when compared to those run by other cadet units across the country. 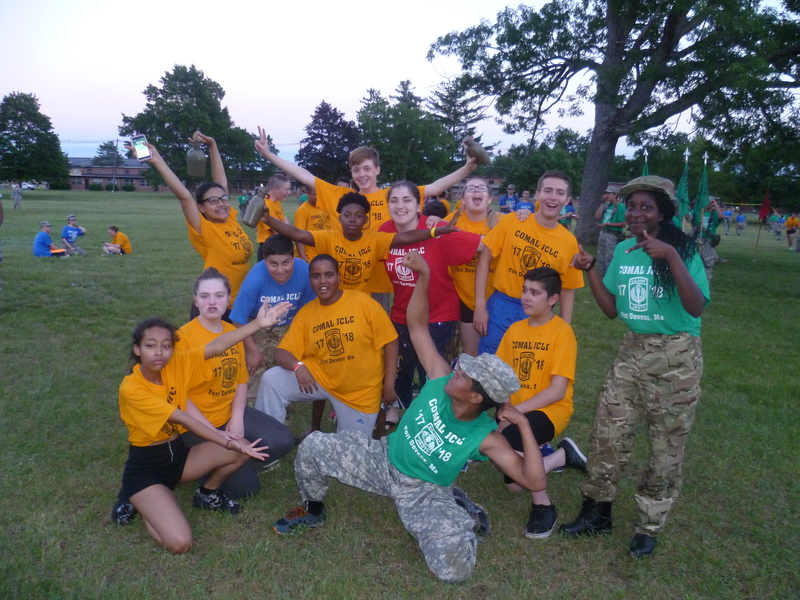 Our cadets parading in their Number 1 uniform on the final ‘formation’ of the JCLC at Fort Devens really brought this point home. Although an ambitious expedition it was excellent value for money. There is a great new air service from Manchester and the JCLC is charged at only $40 per cadet. With the support of the Ulysses Trust, Pupil Premium funding, and the contribution of funds from TS Stirling, no cadet was excluded on the basis of parental income.